The best wedding invitations ever! We have good news for any newly engaged couples out there who are in the midst of wedding planning. We found the best source for truly custom wedding invitations (at great prices) for literally any style event you are envisioning! 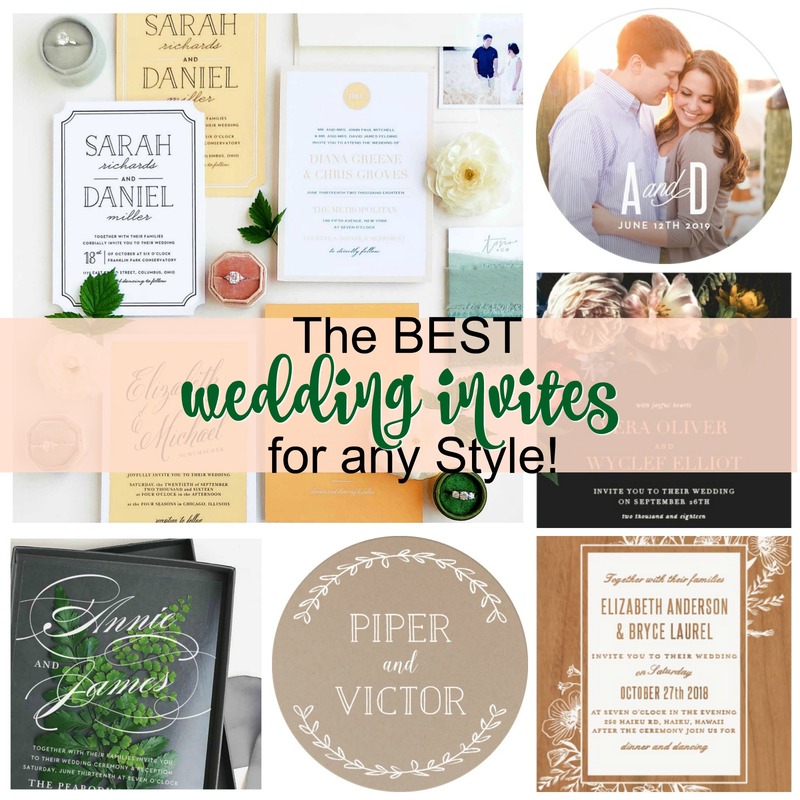 Basic Invite has a complete collection of beautiful invitations, envelopes, place cards, guests cards, wedding coasters, and, well, just about anything printed you could possibly want for your special day! We love Basic Invite for many reasons: the site is easy to use, has lots of free perks, they’ll send you a custom sample, their products are affordable AND high quality, but most of all we are obsessed with them because their stuff is just so darn pretty!!! What sets Basic Invite apart from almost any other online stationery company is the fact that they offer practically unlimited color options with instant previews online. Which means once you select the design you love, you can then change the color of EVERY element on the card with more than 180 different color options. So, you can make sure the card is exactly how you want it – down to the littlest detail. Oh, and they are just as colorful with their peel and seal envelopes too. You can choose from 40 colors to make your envelope pop, like this perfect-for-fall pumpkin! Maybe you are dreaming of a sweet and southern style event? You’ll want to take a gander at these romantic floral inspired Wedding Invitations. The card features a frame of beautifully arranged flowers and the details of the wedding set in a complementary pairing of fonts that will leave your friends and family speechless. Basic Invite brings it with their wedding coasters which make great favors for your friends and family. Did you see the mason jar with fireflies? So cute! Basic Invite also hooks you up with some awesome freebies, like your very own wedding website AND an address collection service. Free is always nice, but zero dollars is ESPECIALLY good when you are planning a wedding! We like that the mobile-friendly wedding websites are completely customizable just like the wedding invitations! (You can even choose a design to match your invites!) They are also super easy to use. You can instantly upload all of your wedding details along with images and a map with directions. And the address collection serves allows you to request your addresses with three simple steps. You just share a link with your guests, collect their addresses and you’ll get free envelope printing. Ready to get YOUR wedding printing needs taken care of? Visit Basic Invite and find the invites of your dreams. Here’s a coupon code so you can SAVE BIG ON EVERYTHING! Use code: 15FF51 for 15% OFF.